Eloise Hockett has an EdD from George Fox University, a Master of Education degree from George Fox University, and a Bachelor of Music Education degree from the University of Minnesota Duluth. Prior to coming to George Fox, she spent more than 20 years in music education, teaching in private and public schools, and private studio instruction. 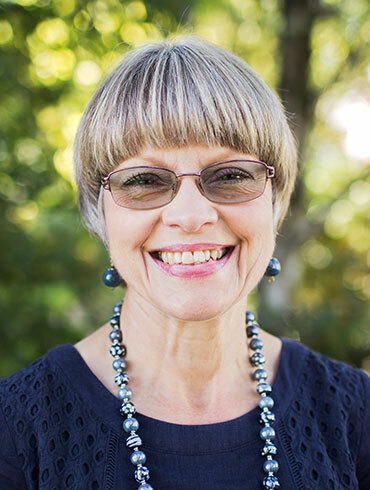 At George Fox, Eloise directs the Master of Education program, teaches in both the master’s and doctoral programs, and serves on a variety of committees. Eloise is a frequent traveler to Kenya, where she has helped to develop a peace curriculum for the Quaker secondary schools, assists with professional development in Quaker schools, and promotes education efforts for girls and women in rural areas. Eloise’s research interests include adult teaching and learning strategies, peace education, cross-cultural teaching and learning, and cultural humility. Eloise enjoys playing violin and piano when possible, hiking, snowshoeing, backpacking, and spending time with her family and friends. Hockett, E. (2012). Developing a peace and conflict resolution curriculum for Quaker secondary schools in Kenya. The Journal of Research on Christian Education, 21(1), 6-23. Hockett, E. (2014). Kenya Quaker school peace curriculum pilot project implementation: A case study of successes and challenges. Paper accepted for presentation at the American Educational Research Association (AERA) Conference, April 2014. Hockett, E. (2011). Teacher professional development in Kenya: Moving toward integration. Paper presented at the American Educational Research Association (AERA) Conference, April 2011. Hockett, E., & Muhanji, J. (2011). The impact of the peace curriculum: One school’s story. Quaker Life (March/April). Hockett, E. (2013). Cultural humility and the intersect with global engagement. Invited presenter: ICCTE regional conference, May 29-30, 2013, Newberg, OR. Hockett, E. (2013). Cultural humility: Rethinking the concept and practice of cultural competency. Presentation at the International Association for the Promotion of Christian Higher Education (IAPCHE) conference, May 23-25, Grand Rapids, MI. Hockett, E. (2012). Using reflective practice as effective professional development at a college in Kenya. Presentation at the World Federation for Associations of Teacher Education, November 7-9, Nairobi, Kenya. Hockett, E. (2012). Cultural humility: Expanding the concept and practice of cultural competency. Presentation at the World Federation for Associations of Teacher Education, November 7-9, Nairobi, Kenya. Hockett, E. (2012). Kenyan Quaker schools peace curriculum: Implementation and follow-up results. Presentation at the World Federation for Associations of Teacher Education, November 7-9, Nairobi, Kenya. Hockett, E., Samek, L., & Headley, S. (2012). Cultural humility: A paradigm shift through global engagement. Presentation at the International Christian Community for Teacher Education conference, May 2012, Azusa Pacific University.